The Monte Carvoeiro resort offers family-friendly vacationing along Portugal's beautiful Algarve coastline. The resort features one or two bedroom timeshare apartments centered around an eye-catching fountain in the central courtyard. 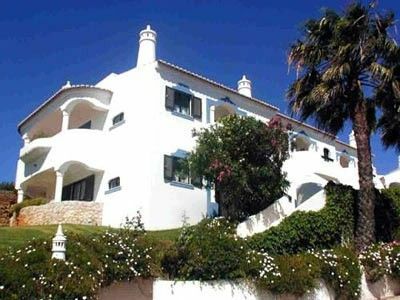 It is also conveniently located to many attractions including golf courses and the picturesque Atlantic coast in one of Portugal's sunniest locations. 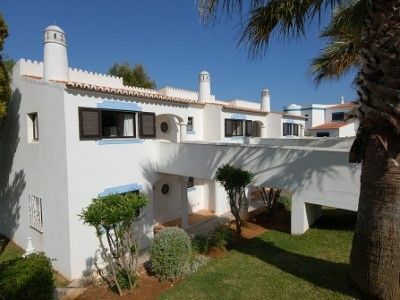 These one and two bedroom Portugal timeshare resales can accommodate four to six people respectively, with Portuguese style furnishings throughout. Every apartment has its own balcony where you can enjoy views of the central resort fountain and the spectacular, tree-lined grounds. Inside, the entertainment center, living spaces, and partial to full kitchens complete the comfortable atmosphere. You can cook a meal for two or a family right there, or if you prefer to eat out, there is a pizza restaurant/snack bar onsite. Monte Carvoeiro has ample parking for all of its guests, but even if you prefer to walk, it is centrally located just five minutes’ walk from the Carvoeiro village main square and beach. If you love walking you can explore for hours along the cliffs, where the unspoiled vegetation and stunning ocean views greet visitors from near and far. Residents at the resort also receive discounted access to Carvoeiro (Pestana) Golf & Resort for tee time on the two championship-level greens. At the resort itself, you will find many more reasons to fall in love with these Portugal timeshare resales. 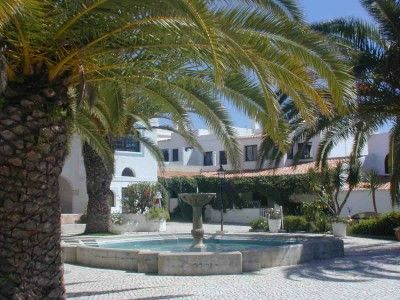 The entire resort is laid out to resemble a traditional Portuguese village, not a modern resort. The apartments, villas and townhome buildings are set slightly apart for added privacy, and the village center is comprised of a majestic fountain and a large outdoor swimming pool. Residents can also use the Tennis and Recreation clubs to work out and compete against each other in a friendly tennis match. The site also has a medical clinic. With days of sunshine and ocean beaches just a short walk away, the Monte Carvoeiro resort and the Algarve region of Portugal make an ideal combination for any vacationer. Here, you will quickly feel right at home in a location you'd fall in love with. Contact Monte Carvoeiro Clube Specialist Today!